I’m thoroughly enjoying my vegetable garden this year. It’s bringing me a huge amount of pleasure, and the vegetables and fruit we are getting from it taste so much better than store bought. But is my very small contribution really making a tangible difference to my footprint on this planet or to promoting local, seasonal food? Let’s face it, my garden is not producing even half of the fruit and vegetables my family and I actually consume, and while I may shop at local shops and farmer’s markets as much as possible I would estimate that forty percent of my food budget is still being spent at the supermarket. So is it all this effort really worth it? Absolutely, positively, definitively - Yes! Certainly I am doing things on a small scale. While I’m blessed to have a really big garden I was not prepared to convert it all to food production - mostly because I really love my flowers. Some people might question how a couple of raised beds and a few pots could make a real difference to how and what we eat, but my experience is proof positive that even gardening on a small scale can change both your lifestyle and how you eat. I can’t count the number of times this year I have invented a new recipe based solely on what I could harvest from the garden - even if it was only a handful of this and a handful of that. It’s given me a whole new outlook. Instead of planning weeks in advance, I’m experiencing a new spontaneity in my cooking and the rewards are enormous, both in terms of taste and eating experience. There is nothing like dining on something that was actually growing not half an hour earlier, and that travelled less than fifty feet to get to your plate. 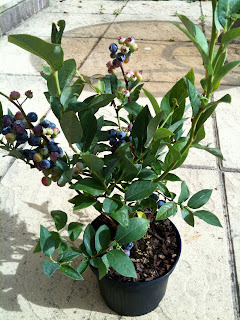 While my one blueberry plant is not going to make even a dent in my family’s blueberry consumption (we love this superfruit!) and my six little strawberry plants are definitely not enough for a banquet, the fruit we eat from our plants reminds us of where our food really comes from - and it really does taste amazing. So yes, even a small vegetable garden or a few pots - even one pot - can make a difference. In fact, the UK’s leading gardening charity, Garden Organic, have launched the One Pot Pledge to encourage people to grow their own produce on however small a scale. Over 10,000 people have already to pledged to do this. Think of the effect that could have on what and how they eat and also on the environment. One pot may not be a lot, but 10,000 plus sure are! The same holds true wherever you live. Even if you only grow a little, it has a positive effect on a much wider scale. With or without a garden, you can produce some of the food you eat. It’s amazing what will grow in patio pots or in a pot on the windowsill. So yes, gardening on a small scale does promote sustainability, local and seasonal food. Even the smallest effort has an effect, and is totally worth the effort. So if you haven’t already, don’t hesitate a moment longer - get growing! You’ll be very glad you did. Totally agree with all you are saying. Your own food is just so much tastier and for me as well it has opened the door to finding new ways to prepare the fresh produce.